Description: Birdseye view looking west across Arkansas River. Photo taken from top of Broadview Hotel. Bridge at left is the third bridge erected on that spot. The far bank of the river was constructed from fill obtained by the removal of Ackerman Island during a WPA project (see item wschm_S2-2.1.1). At right is memorial park and fountain installed in 1934 to commemorate Wichita banker Ben McLean. Business names in view include: Fred Wasson Oil Company, J. W. Johnston Wool & Fur Company, Hobbs Chevrolet Company Used Cars, and J. H. Turner. Davis Hall of Friends University is barely visible in the background. Keywords: Business and industry, bridges, parks, rivers, street scenes, transportation, automobiles, Delano, West Wichita. Description: View looking northeast from bend in Little Arkansas River toward North High School. At center is Minisa Bridge which carries 13th Street traffic over river. Keywords: Wichita, rivers, bridges, education. Description: Co-eds approach Minisa Bridge along 13th Street west of Wichita High School North. Wichita artist Bruce Moore designed decorative elements. North High students chose the name for the bridge which opened in 1932. Keywords: Wichita, bridges, street scenes, people. 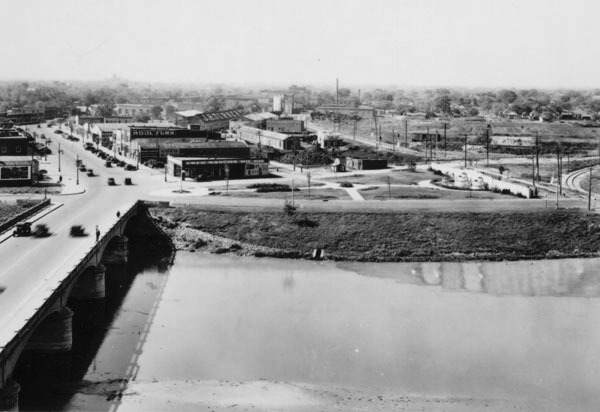 Description: Birdseye view looking south along Arkansas River from Broadview Hotel, which was located at Douglas and Waco. In the distance is Maple Street Bridge. Keywords: Aerials, street scenes, automobile, bridges. 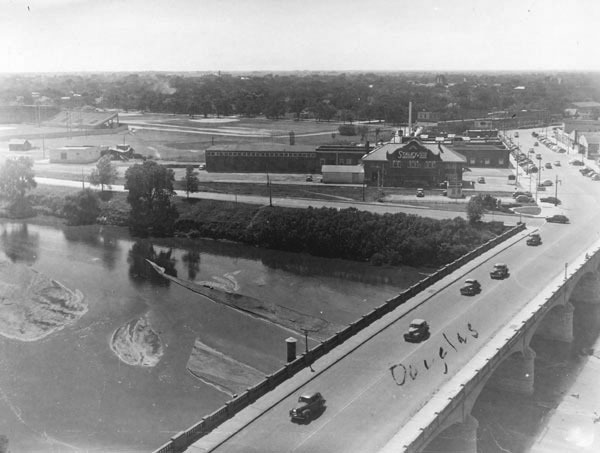 Description: Birdseye view looking southwest from Broadview Hotel, which was located at Douglas and Waco. The Douglas Street Bridge is in the foreground. 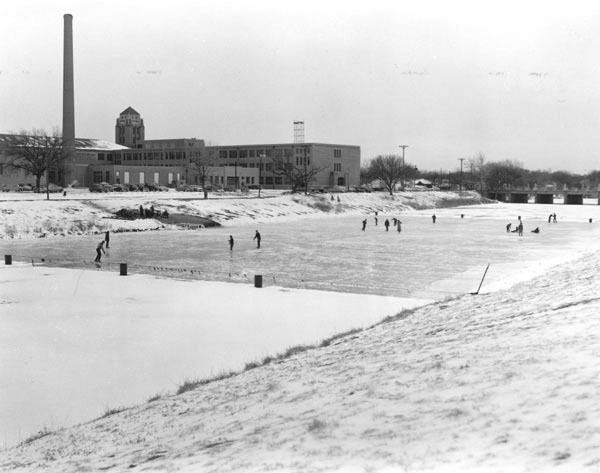 Description: Ice Skating on the Little Arkansas River by North High School. Location was 13th Street close to Waco, northwest corner. Keywords: Sports and recreation, education, bridges. Description: Interior view of Fourth National Bank & Trust Company elevated walkway completed April 19, 1963, connecting the bank and the Wichita Plaza over Market Street. Keywords: Wichita, business and industry, bridges, buildings. Description: Fourth National Bank & Trust Company elevated walkway completed April 19, 1963, connecting the bank and the Wichita Plaza over Market Street. Description: View looking northeast toward downtown Wichita from Kellogg Street overpass of McLean Boulevard. Maple Street Bridge over Arkansas River at left. 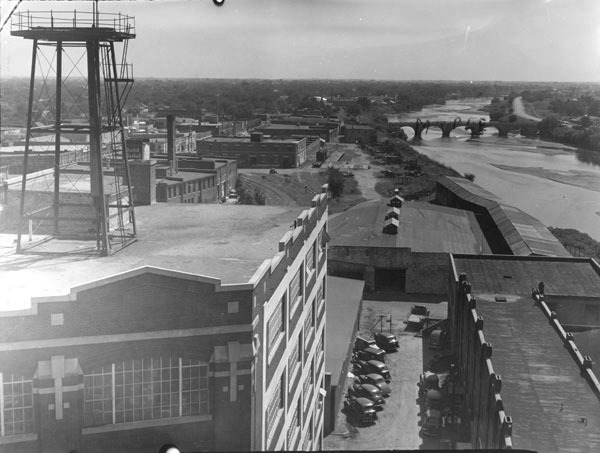 Industrial area along river with Central Building, Kansas State Bank & Trust Company building, Wichita City Hall and Allis Hotel in background. Keywords: Wichita, buildings, rivers, bridges.